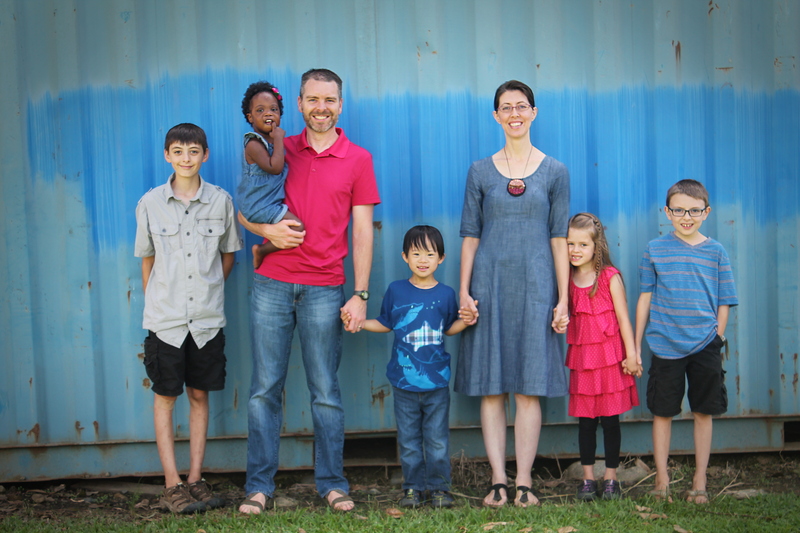 The Dooley family is our mentor family as we settle into life at Kudjip and they have been wonderful. Our second week here they took us down to the hydroelectric dam to play in the water. This power source is a huge blessings and I’ll blog more about that later. It also creates a fun play place as well as kaukau (sweet potato) washing station and rock collecting resource for various projects around the hospital station. Next to collecting bugs, gathering rocks is a favorite activity for our young Masons. Between the water and the rocks I’m sure visiting the hydro will become a favorite activity. Nathan and I also got to drive for the first time. While the hydro is within walking distance from the house, in the afternoon sun it’s a longish walk, so we took the Land Cruiser (a necessary vehicle to make it over the bumpy roads in PNG). The driver’s seat is on the right side of the vehicle and we drive on the left hand side of the road. It’s a little strange and I kept grabbing the door to try and change gears before remembering I needed to use my left hand. But I successfully drove on the left side of the road for the first time! (Going 10 miles an hour on the station and never meeting another vehicle, but that’s only a minor detail, right?!). Statistics. Our culture knows statistics. There are numbers for how many births every year and what the most popular names for those babies were. Numbers for how many deaths and what was the cause of death. Everything is documented. It’s a different story in a very rural, developing nation like Papua New Guinea. PNG has one of the highest infant and maternal mortality rates in the world, but any statistic you find would likely not show the whole picture. “People live and die in silence,” said Dr. Scott while giving a hospital tour. No statistician keeps track of every birth in the Jimi Valley. The man who died in the Sepik Province is mourned by his family, but his death by cancer is not added to the total tally. But it is these individuals that matter here at our hosptial. Each person is given the best care possible. Each person has not only their physical needs cared for, but they are treated with dignity and respect. The people of the country know this is true and will often travel for hours or days in order to be seen at Kudjip Nazarene Haus Sick (Hospital). It is not in silence that people live and die here at the hospital. It is surrounded by those who see God’s imagine stamped on each life that walks through the doors. Would you pray for the nurses, doctors, administrators, maintanence staff and others as they give the best care possible with limited resources. I kept glancing out the window to see a couple of men on the porch coming to visit. Oh wait, those aren’t men. Those are our bananas. Several bunches in our backyard fell off the tree early and Nathan strung them up on the porch while to finish ripening. Randy Goossens brought over a couple of button up shirts to help clothe the giant bunches. Why must they be dressed you ask. Because fruit bats find this yellow fruit delicious. And they don’t politely partake of one or two whole bananas, but enjoy a nibble from various bananas all around the bunch. So, we carefully clothe them with button up shirts for easy human access. I have now gotten used to looking out and seeing the banana men who call our porch home. Thirty-one hours. From the door of my parents’ home in Oregon to the door of our home in Kudjip, Papua New Guinea took 31 hours. I imagine it’s longer for those traveling from the Midwest or Eastern USA, but it was still plenty long. I think whirlwind best describes the trip. It went well over all, but each time we landed it was a race to the next plane. And the race started at the very beginning. We arrived 2.5 hours early with only 2 people in front of us in line and still just made it through security to the gate as they started boarding. After landing in San Fransisco we made our way to the ticket counter to get the new boarding passes, went through security, and had enough time for a bathroom break before boarding again. By this time it was 11:30pm and we were all tired. The kids slept for 8-9 hours, which helped a good part of the 14.5 hour flight slip by peacefully. The remainder of the time went fairly well. The oldest three watched some nature videos and did a few fun activities we purchased with support from our LINKS churches. The youngest two got a little antsy, but I really can’t complain, because I was feeling antsy too! After landing in Sydney with very little time to spare, our oldest daughter fell apart. She was tired and didn’t want to pull any bags or carry her backpack. She wanted.to.sleep! Big brother stepped up and helped her out. The strollers we hoped to have available for use in the airport had been sent straight to PNG, so we were quite a sight trying to juggle kids and bags while moving as quickly through the terminal as possible. Security must have felt bad for us (or they didn’t want to listen to tired kids complaining) because they whisked us to the front of the line. Next came the transfer desk to get our new set of boarding passes. It takes for.ev.er to get seven people and all their luggage squared away, but thankfully they called ahead and had the plane held for us. There were also courtesy strollers here! My tired back was quite thankful for this small luxury. After rushing to the gate and boarding the bus out to the tarmac for the plane, and getting everyone situated . . . the flight was delayed because of a problem with the runway. I thought for sure we’d miss our next flight as it, too, was going to be a close connection. The pilot had radioed ahead that we had a close connection, so there were people waiting at the plane to help us through immigration, collecting our bags/strollers/carseats and onto customs. All but one bag came through, but we decided not to wait for it. Just as we left customs someone ran up with the final bag. At this point we re-checked the baggage, got new boarding passes and headed towards the domestic terminal. Once again was a security check (I’ve missed mentioning a few others on the journey), but thanks to all the helpful people working at the airport we made our last flight. The one hour trip to Mt. Hagen was some of the most turbulent of the trip. Finally, the plane came out of the clouds to show the airstrip surrounded by beautiful green mountains. While circling once we saw the MAF hanger and planes and then we touched down. And it was here, on the ground, that I got air sick. With all the rush I had forgotten to take the final dose of meds to help prevent it from happening. But, thankfully, we didn’t have to rush off the plane this time. Two of the missionaries from the hospital station met us with two vehicles. One came to haul the people and the other came to haul the luggage. Eleven of the bags/carseats did not make this final flight, but arrived the next day. It was about a 45 minute drive to Kudjip Nazarene Hospital and we were greeted by a crowd of missionaries in the front of our house. It was fun to meet all the people in person we had heard about and interacted with online. It was a tiring trip but about 2 minutes after arriving the kids were busy looking for all things that creep and crawl and off to play with new friends. Sunday morning Nathan went with the oldest three kids and several of the other missionaries on station to a bush lotu (church) for the morning service. It took about 20 minutes of driving and while they could have driven all the way in the Land Rover, the last little bit was harder to drive, so they walked another 20 minutes of so to get there. The churches like to know ahead of time that missionaries are coming so they can prepare. There was a flower petal path leading up to the door and everyone sat down on the floor. The service lasted for about two hours and was packed full. This coming week they are planning to expand the building to help accommodate everyone who attends. Flowers usually decorate the front, but extra care is put in when visitors come. They also gather produce to send home with the missionaries. Everyone took as much as would fit in backpacks and arms, but because the Land Rover was left behind, they couldn’t take everything. Nathan had practiced a short testimony in Tok Pisin to tell the congregation why we are in PNG. After the service they hiked up the road a ways for a picnic lunch. Many of the kids joined them on the hike as they crossed bridges like this. On the way back, some of our kids decided just to jump down in the ditch rather than try to cross the tree bridge again. The scenery was amazing, the people welcoming and a wonderful afternoon was had by all. Nathan and I were sitting in the kitchen with Pastor Simon busy with language lessons when our bug boy burst through the door. “Mom! You have to come help me with this beetle!” I shushed him and told him I’d help him when the lesson was done. He not so patiently waited until the end and I stepped out on the back porch of the house we were staying in for the week in Timil Waghi. We think it’s a rhino beetle and it took some effort for Nathan to get it down. After hissing at the stick for awhile, it finally grabbed the pesky thing that was harassing it with it’s enormous jaws and Nathan was able to pull it off that way. This one did not go into a jar, but stayed outside on the porch. Stay tuned for the next creepy crawly installment. Language learning is an interesting thing. My brain is searching for a word that is not English and, Oh look! I found the word! . . . in Hebrew or Spanish or that tiny bit of Russian I learned years ago. It doesn’t do a lot of good to tell some who speaks Tok Pisin “dasveydanya” in Russian to say goodbye. While out in the bush, a couple of dogs chased a cat up to our porch. We opened the door and yelled at them to “Die! Die!” No, we weren’t hoping for their early demise, but were yelling “Stop!” in Hebrew. Nathan introduced himself as “Natan,” the Hebrew form of his name and I’ve remembered more Hebrew words in the past two weeks than I could have hoped to have remembered six months ago. Thankfully, Tok Pisin is one of the easier languages I have tried to learn and am able to understand simple conversations. Nathan is doing a great job understanding and speaking. Eventually, my brain will grab the correct Tok Pisin words, but for now I have a strange new language floating in my brain that’s a mix of English, Spanish, Hebrew, Russian and Tok Pisin.